Heavy Duty Stairlifts and Bariatric Stairlifts are all made with a unique weight capacity of up to 29 stones. If you are experiencing difficulty using your stairs and considering a heavy duty stairlift then an individual assessment with an Occupational Therapist is strongly recommended as your safety on your stairs is essential. There may be individual factors which determines which style of stair lift suits you needs best. It is advisable that the stairlift covers the whole staircase. 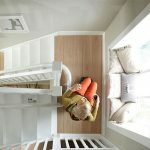 Some people will attempt to save costs by installing a straight stairlift on a curved staircase and attempt to manage the first or last few steps. However, if your condition deteriorates, you may no longer be able to manage this. The stair lifts also have different controls depending on the dexterity of the person using the controls. The Occupational Therapist would discuss all the options available when the home assessment is carried out . 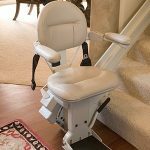 If you have a door or passage way at the top or the bottom of the stairs which may be blocked by the rail of the stairlift, there are options designed to resolve this problem.